The purpose of this document is to provide hospitals and the Joint Commission on Accreditation of Hospitals Organization (JCAHO) a guide prepared by medical physicists recommending tests and procedures for medical lasers to maintain a high level of quality care in a safe environment. The guidance for safe use of laser systems for diagnosis and therapy is intended for use by all health care personnel associated with laser systems’ operation (physicians, nurses, medical physicists), maintenance (engineers), and service (biomedical technicians). The suggested controls are based upon evaluation of potential hazards from laser radiation; unique problems related to operating rooms, outpatient clinics, and private medical offices; and exposure risks to patients and personnel. The control procedures are derived from ANSI Standards Z136.1 and Z136.3. Other resource materials are listed in the bibliography. A growing use of medical lasers is in the area of photodynamic therapy (PDT) where lasers provide a convenient source of intense, narrow bandwidth light. The safe use of the specialized lasers and fiber optics for PDT is to be addressed in a companion AAPM Task Group report and guidance document. Evaluation of medical laser safety and quality assurance (QA) should be performed under the direction of a qualified expert, in this case a medical physicist. Government agencies, independent advisory corporations, and professional societies have published definitions of a medical physicist and a qualified expert. A medical physicist is an individual with his/her principal education in physics with a minimum of a master’s degree plus 4 years of experience in medical physics or a Ph.D. degree with 3 years of experience in medical physics. 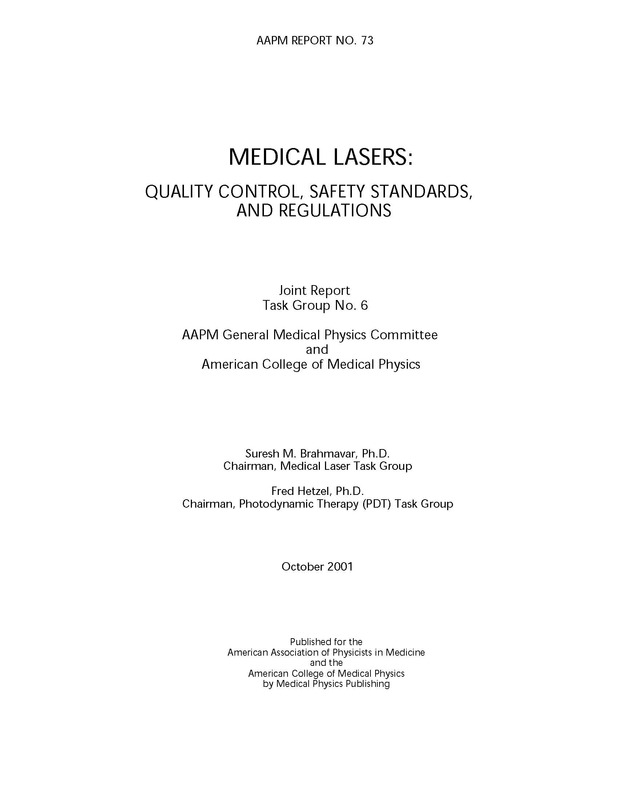 A qualified expert in medical laser safety is an individual who has demonstrated to the satisfaction of the appropriate supervising or regulatory body that Introduction 2 he/she possesses sufficient knowledge, training, and experience to measure laser radiation, to evaluate safety techniques, and to advise regarding protection for laser radiation. Not all measurements have to be made by the medical physicist, but all measurements must be made under the immediate supervision of a qualified expert. The decision concerning which measurements are made by a physicist and which can be made by an engineer or a nurse under the supervision of the qualified expert must be made by the medical physicist who assumes sole responsibility for interpretation.